Mark Godbeer announced his retirement from MMA earlier this year, but he's now taking part in a crazy 'Knockout only' super fight in China. 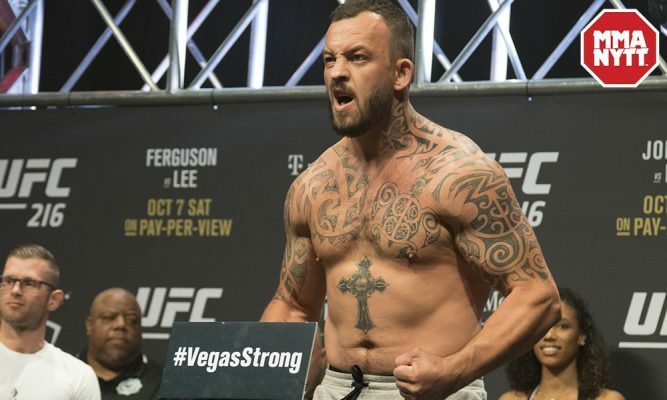 Former BAMMA and UFC heavyweight Mark Godbeer retired from active MMA competition earlier this year, but he’s going to be stepping back into the combat sport spotlight at MasFight1. The event will take place in little over two weeks time on Nov. 10 at Macau, China. Godbeer will be taking on Dutch strongman Ismael Lazaar in a unique ‘stand up only’ fight. The fight was announced this morning by Godbeer’s management Duello Sports Management. Godbeer went 13-4 in professional MMA and held a UFC record of 2-2 with victories over Daniel Spitz and Walt Harris via DQ. The Englishman last fought at UFC Fight Night London last March where he was defeated by Russian Dmitriy Sosnovskiy via submission in the closing seconds of the second round.